Having come back from Melbourne and Adelaide, there are many things that I missed and have to catch up on. The first one is the guest post on Lifehack that I wrote before my trip and sent to Leon, the founder of the website. During my trip, my guest post was posted. 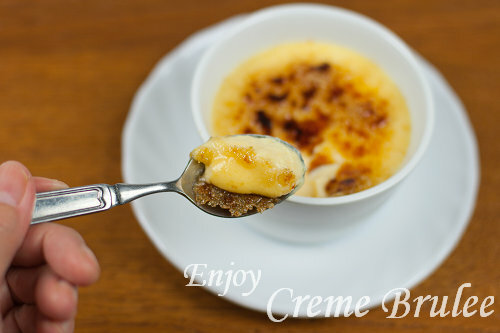 It’s a cooking hack on the classic French dessert, Creme Brulee in a non-traditional, quick and easy way without an oven. Coincidently, MasterChef released an episode on how to cook a perfect Creme Brulee during that time. How did I know? With a love of cooking and eager-to-learn spirit, I've watched nearly all of Masterchef in my hotel every night. To me, watching how the judges put down their brutally honest remarks and how they share their precious cooking experiences and skills in a friendly way with all the contestants, was the most enjoyable time. Why did I write the guest post on Lifehack? Lifehack is a website that share ideas and tips on how to make life easier and more productive. There are great articles contributed by many writers that I enjoy reading and get inspired by. I've subscribed to it for many years, and now feel very honoured to be one of their writers. Hop over for the entire recipe of my first cooking hack on Lifehack. Then you’ll also know why I wrote guest post there. Both you and Leon own a great blog. Mother and son? Congrats! Mmm...looks creamy and delicious. It's my all time favourite. ya, go out and travel a bit, that is where the source of inspirations come from. A creamy and delicious treat! Christine, you've make this creme Brulee sounds like our Chinese steamed egg custard. I think by steaming it is also another good way how it's prepared. Love the idea! Hope you'll have a wonderful day. Travelling is great and I am glad that you love Melbourne!